Simon & Schuster Children's Publishing, 9780027888355, 32pp. "The Truth is," Ming Miao told her five kittens, "you are not Siamese cats but Chinese cats. As a matter of fact, one of our family's ancestors from a thousand cat lives ago was the famous feline Sagwa of China..."
Sagwa was instantly covered with black ink, and before she knew what she was doing she rubbed her nose on the new rule, blotting out the word "not." Now it ordered the people to sing all day -- until the sun went down. 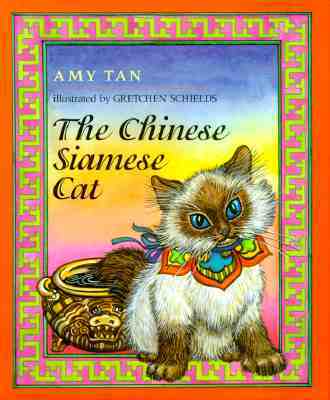 Gretchen Schield's detailed, colorful paintings bring Amy Tan's charming story to wonderful life, making "The Chinese Siamese Cat" a book to be treasured for generations to come.